Earn $3.49 in Rewards credit (349 points) What's This? The Jagwire Pro Polished Brake Kit offers enhanced performance and style. 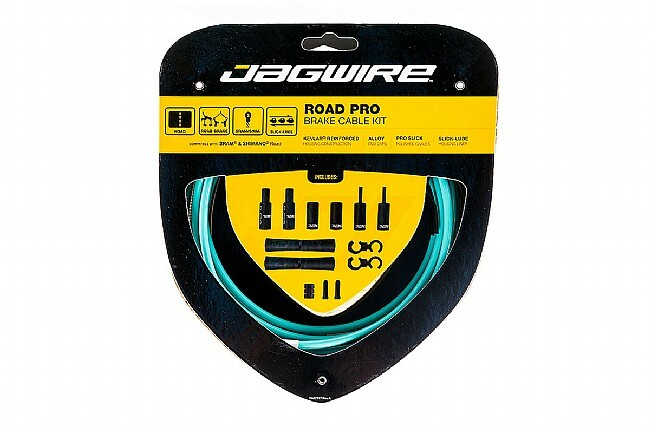 Designed to work with and match Jagwire's Pro Shift kits, the Pro polished brake cables combined with Jagwire's Slick-Lube liners to dramatically reduce friction while Kevlar® reinforced, compressionless brake housing delivers smooth, powerful braking performance. And with all needed parts included, the Pro Polished Brake Kits are easy to install. 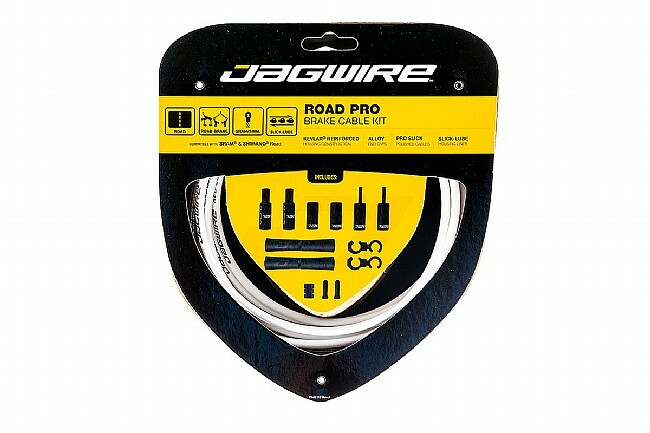 Pro level polished cables combined with Slick-Lube, Kevlar® reinforced housing enhance braking performance. All parts needed for a complete brake cable and housing install on road bikes are included. Kits provide longer housing and cables for large frame with full housing or mechanical disc brakes. These are nice. Not only do they provide nice colors to customize the bike with, they also provide better braking than what came stock on the bike by using compressionless housing. This is my second compressionless kit (new bike build), will never go back to the cheaper stuff. Has a very responsive feeling using this with my cantilever brakes. This kit comes with all the rubber donuts and ferules needed to redo your brakes, and a generous length of housing for most bikes. The compression-less bendable ends worked great with my TRP RRL brake levers. Also used the Jagwire Pro Indexed Inline Brake Adjusters, and the Jagwire Brake Pad Toe-in Tuner Tool (awesome). It's also worth it to buy a bike cable cutting tool, don't mess up your install with an ordinary set of household wire cutters! I use the Pedro's wire cutting tool, makes nice straight cuts through the thick housing. Also an actual awl is real nice to have instead of fidgeting with a nail to open the cable housings up post cut, and a file to get the ends perfect. Save money if you want, but do all this and you will end up with the your brakes set up as perfect as possible.